The concrete may be cold outside, but the dancefloor will be warm inside Goodgod this Friday night. It’s been a while coming, but Yo Grito finally will be taking you on a direct flight to Jamaica (likely to be the first of a few). 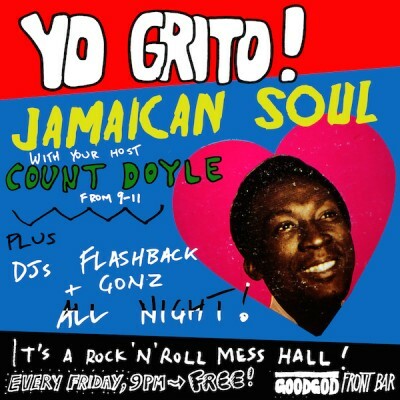 Your pilot for the evening will be Count Doyle, a man that is no stranger to the soulful sounds of the Caribbean. You might remember his party Dynamite from a few years back? Well if you went to those, you know what to expect. If not, then enjoy the very best in Rocksteady, Soul, Ska, Dub and Roots. Boarding commences from 9pm. Plus, from 11pm it’s sweaty business as usual as Flashback and Gonz throw down 7”s that will tear your pants off!! Garage, Rock, Soul, Surf, Punk and Funk that leaves Submarines sunk!